One of the most remote areas in New Zealand, the West Coast is perfect for exploring in a campervan. The region is home to rainforests, rivers, caves and impressive glaciers. Start your journey in Greymouth, and from there you can explore the wonders of the West Coast. There are a lot of sights to see in the West Coast, as well as plenty of holiday parks and campsites so that you can comfortably travel in a campervan. Here are some destinations you should consider adding to your road trip. This incredible glacier is an unmissable stop on the West Coast. Plenty of vantage points offer stunning views of the glacier, and you can also opt to take a scenic helicopter flight. The glacier is not the only sight worth seeing in this region. Visit local waterfalls and lakes and take to some of the hiking trails. Where can I stay in Franz Josef with a campervan? The Franz Josef Top 10 Holiday Park is a great spot to spend the night. Close to the famous glacier and surrounding hiking trails, the park offers powered and non-powered sites for campervans. There is also a communal shower, laundry, games room and TV room. For anybody looking for adventure, Punakaiki is a great destination. Tourists visit the area to see the blowholes carved into the coast, and the impressive show put on by the ocean. The interesting Pancake Rocks formations are also popular, and there are many hiking trails you can follow in the area to get some great photos of the unique landscape. Where can I leave my campervan in Punakaiki? Punakaiki Beach Camp is a convenient stop so that you can spend time exploring this beautiful region. With powered and non-powered sites, the park also has views of the surrounding limestone cliffs and is within walking distance from the beach. 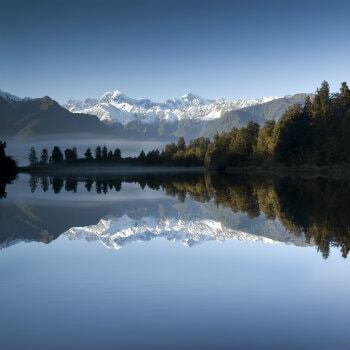 Aspiring photographers will have plenty to work with at Lake Matheson. This stunning landscape offers clear views of New Zealand's tallest mountain, Mt Cook, and is also nearby to popular Fox Glacier. The area is also a culturally significant Maori site, and visitors can explore the lake via walking trails. The lake is also a great spot for spotting birdlife. Where can I stay in Lake Matheson with a campervan? 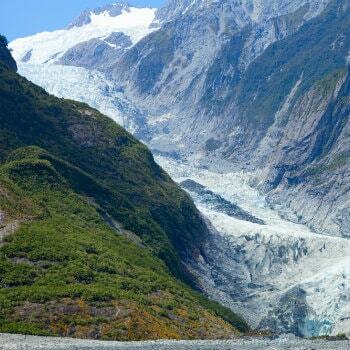 Stop in at the Fox Glacier Top 10 Holiday Park in the heart of New Zealand's glacial region. The park itself has magnificent views of Mount Cook, and offers toilet and shower facilities, a laundry and a communal kitchen. Not only can you pick up an affordable campervan rental in the west coast's biggest city, there is also plenty for you to discover in the coastal town. Shantytown, the replica of an old gold-mining town is a particularly popular attraction. If it's adventure you are after, Greymouth also offers plenty of hiking trails, and cycling tracks. Where can I stay in Greymouth with a campervan? Greymouth Seaside Top 10 Holiday Park offers powered and non-powered sites in a convenient location close to town. The park also features BBQ facilities, laundry, waste disposal, kitchen and bathroom facilities, and a games room. 2 Chesterfield St, Blaketown, Greymouth. Have you travelled to New Zealand's West Coast? Let us know what you would recommend seeing.